Joe Hartley and I had the opportunity to make the trip to Lexington Ky to watch this giant scale fly inn. The two planes we are working on, the Sig 1/3 scale Spacewalker and the Balsa Usa Citabria were not finished in time to fly so we will have to wait until next year to do some flying. Thanks to the hospitality of Joe's brother Cliff and sister in law Judy we had first class accommodations. When you are around great people you realize that the planes are secondary. Cliff Hartley should have a World War One bird ready by next year and if the Spacewalker and Citabria hold up that long all three of us should make a showing in 2002. The fly inn was well organized and the site is fast becoming one of the best in the area if not the best. The site also has a first class paved area to fly control line aircraft. I believe that Lew McFarland and EX-Cell hobbies might have had some presence in this area. 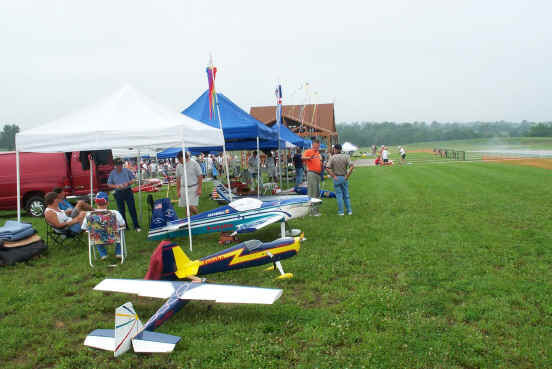 Below are some of the aircraft that were present at the Bluegrass Festival Of Giants. I wasn't able to get all of the information on who built what so this page is by no means complete of all of the action and people present. Saturday morning shot of the flight line. By afternoon the fog had dissipated and we had some sunshine on the afternoon. Pictured in the foreground is a 50% Cap 232 that flew extremely scale like. There was a good variety of aircraft at this fly inn and the action kept the crowds attention. Alan Yendell of Atlanta Georgia working on his beautiful Neuport 24. The Neuport flew as great as it looked. The Newport is 30% scale. 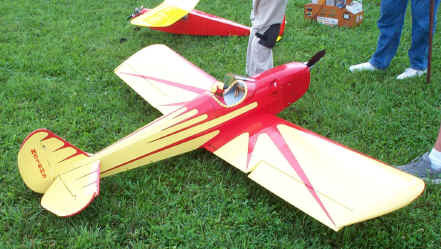 Front view of Alan's Neuport 24. 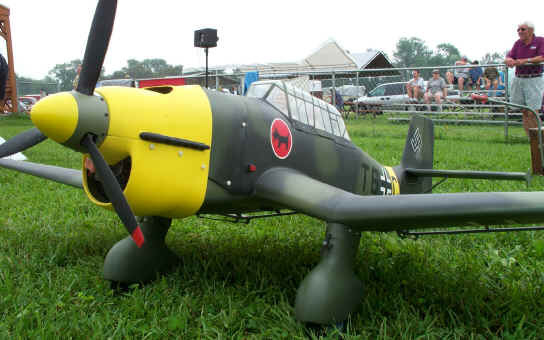 Vince Maryanski's Zirolli Stuka. 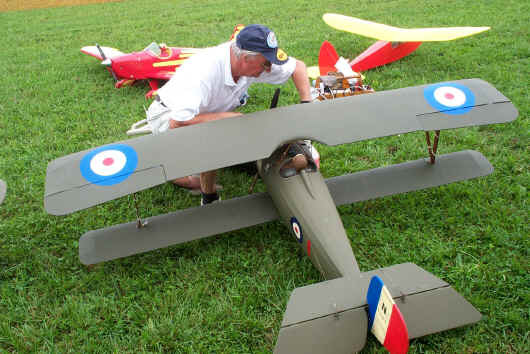 Vince is from Naperville IL and did a great job building and flying this American 70 powered Zirolli Stuka. A great looking Zirolli B-25. Another airplane that I was unable to get any information on. Jim Nicosia was the flier of this enlarged 112" span Zirolli Corsair. Powered by a 3W-120 and weighing in at 43#. The finish was oil base house paint with a mix of royal blue and flat black. 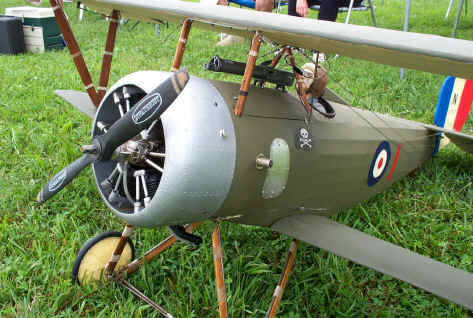 Great flying plane! Ken Peet of Atlanta Ga built this pretty Sig 1/3 Scale Spacewalker. It's powered by a US 41 and painted with automotive acrylic enamel and weighed in at 19.5 pounds. The Spacewalker flew scale like and Ken said that it had a large flight envelope. 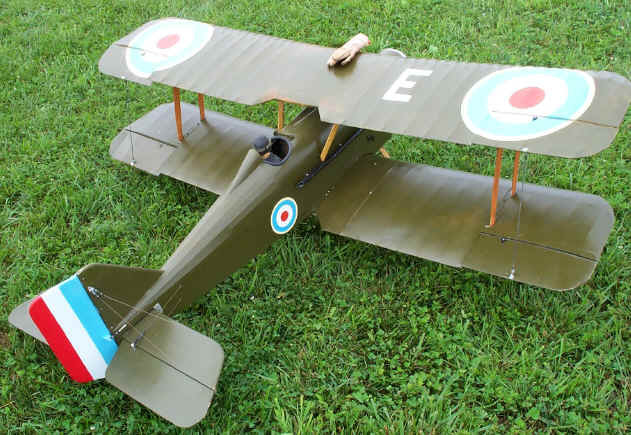 This plane looks like it would make an excellent first giant scale plane with its butterfly landings and gentle flight characteristics. 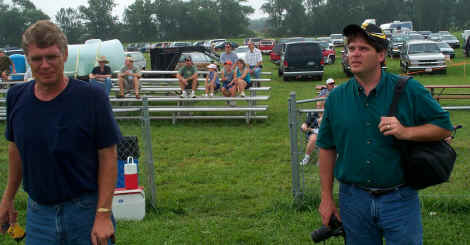 Brothers Cliff and Joe Hartley at the Bluegrass festival of giants Lexington Ky 2001. Joe is watching some of the good flying while Cliff is admiring the pinking tape on a scale cub. 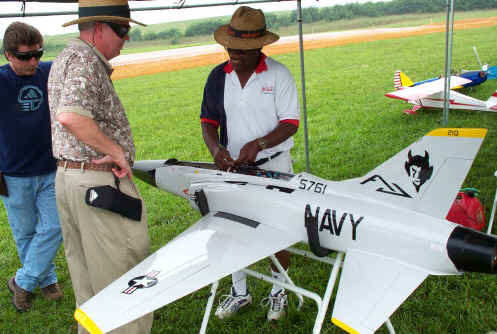 Beautiful turbine jet model that put on an impressive show. 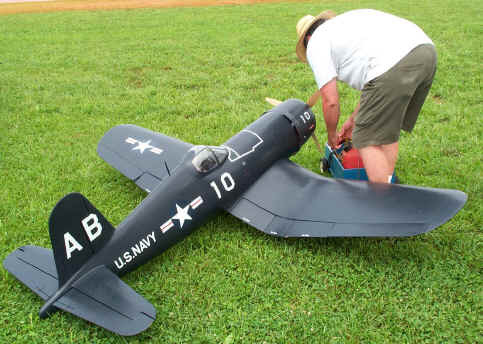 The model flew flawlessly and was a crowd pleaser.